Credited to Duncan Usher, Germany. A fox cub uses a slide in a disused gravel pit. Not just once either, so without anthropomorphising the grin on his face, he must have enjoyed it. Various places in the media and online have it. He had a major itch! Would make a great scene for a 1950's Sci-fi. When I look at that pic I hear "Thus Spake Zarathustra". Elvis is in the building!! That's an African Cave Spider! They had people eating them once on Fear Factor. The feelers/antannae/palps thingies on that bug look like the hands of the "Why u no ....?" guy. I'm not sure that's a spider. gravdigr, that is one beautiful bug. This view is from near the summit of Alderman's Hill looking across Greenfield to Alphin Pike. Folklore tells the tale of two giants, Alphin and Alder who lived on their respective hills. Both sought the affections of Rimmon, a water nymph who lived in the waters of Chew Beck below. Rimmon chose Alphin, which infuriated Alder and the two giants fought, hurling rocks at each other until Alphin was struck and killed. In her grief, Rimmon cast herself from rocks into the valley below and joined Alphin in death. There is a strong likelihood that this tale is the mythologisation of a Dark Ages battle that could well have taken place here, between the advancing Angles of Northumbria and the Celts of Southern Rheged. Anyone familiar with the tale of the battle of Win Hill, will remember that in c.626AD, the Northumbians defeated the Mercians by rolling boulders down the hillside. The Northumbians had taken Elmet (modern day West Yorkshire) in the early part of the 7th C and advanced on Rheged, which itself fell sometime before 730AD. There are a number of pointers in the landscape to this area being an ancient boarder and even the place names leave clues. Alder being of German origin, Al being a Celtic word for a rock or a hill. 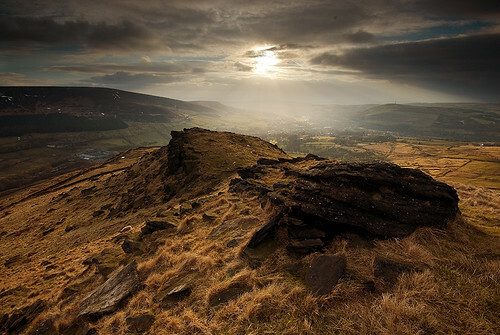 Saddleworth Moor is one of my favourite places. Whenever we go to Manchester we have to drive across the Pennines, crossing the moors as we do along the highest motorway in England. It's had a shadow cast across it since the Moors Murderers in the 60s, but for anybody raised in Manchester, or either side of that stretch of the Pennines, it's always been part of the collective conscious.